Do you want to put up a fence outside of your home or business that makes a statement? Or have you been thinking about installing an outdoor staircase with a custom metal fence to match? Acadia Stairs can provide you with a wide range of metal fabrication products. 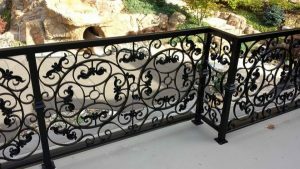 While we specialize in creating statement staircases, our talented contractors are also skilled in creating metal fences for those looking to incorporate metal into other areas of their home or business. Our outdoor metal fences are beautiful creations that will enhance the curb appeal of your entire property. Not sure what you want in terms of design? That’s not a problem. We’d be happy to discuss possible options with you and show you our portfolio of past projects to gather ideas from. In addition to helping home and business owners create the metal fences of their dreams, Acadia Stairs can also help you pair custom metal fences with outdoor metal stairs. Custom stairs are our primary focus, so we won’t have any problem showing you examples of metal stairs and outdoor metal fences that complement one another perfectly. Whether you want to install a large metal staircase with a large fence that borders a big building or a small metal staircase with a smaller fence around the back of your home, we can create a combination that works best for your needs. From steel to aluminum and stainless steel, we utilize a number of materials for all of our fabrications, and we can ship your fence anywhere within the United States. Eager to get started? 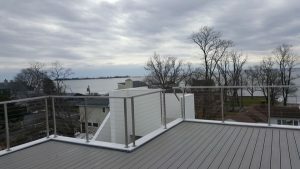 Reach out to Acadia Stairs at 845-765-8600 today to learn more about the custom metal fences that you can install in or around your home or business today. "Acadia Stairs came through for us without a hitch... The price was very reasonable and our new stairs are beautiful! We highly recommend this company!"